The big assumption is that the online experience will be better on the Nintendo Switch, compared to past experiences. That IS just an assumption. It could still be player-to-player connections instead of server-based and they're just charging you to get some money. And, of course, if your connection is crap, it won't matter if there's a server because it's crap. Let me say this much: Most of the time, I already have quite smooth connections on Super Smash Bros. For Wii U. My own wi-fi connection is great, and it's sometimes ruined by people who live in Third World areas, such as Mexico or Quebec. My trick to get Mexicans to leave the lobby is to switch my player tag to TRUMP2016 and BUILDaWALL, along with the all-encompassing GROSSLAG and FIXurLAG tags I have. Either that, or everyone else in the lobby will just leave ‘cause they'd rather go than wait for the lagger to go. My point is that, for being free, Nintendo's existing services suite isn't that bad, and there's no indication that the online gameplay would actually get any better. Yeah, that's disgraceful. As a result, the Nintendo Switch and its controllers don't even have a microphone, because Nintendo can't be bothered to source one because whoever they used before is hopefully out of business by now, or at least fired if it was internally developed. And yet, folks still want voice chatting in their 21st century online gameplay. So what does Nintendo do? Apparently, they're making an app! On the SMARTPHONE. If you want social features on your Nintendo system, DOWNLOAD THIS APP ON THIRD-PARTY HARDWARE. But ONLY if you pay us a subscription fee. EARTH TO NINTENDO: People can already set things up with their buddies online... without needing to pay for an app! Shocker. In terms of what this Online Lobby would be like, who knows. Would it be as simple as your Friends List on your Wii U or Nintendo 3DS, where it just tells you if someone has an open room in a game? Would it be an all-game-encompassing version of what Mario Kart 8 has? We can assume that this means Nintendo will give away one Virtual Console game a month that every Nintendo Switch owner will get, since it's free and takes very little space. Once the month passes, it goes away (unless you buy it). These won't just be ordinary Virtual Console games... but NEWLY-ADDED ONLINE PLAY. This means you can play games like Donkey Kong Jr. Math's multiplayer mode with your friends across the world, or wait for your friend to die in Super Mario Bros. so you can play as Luigi. There's huge potential here for some cool stuff, like, say, Street Fighter II with added online multiplayer. (Ted Cruz could live out his college days while on the Senate floor as a Street Fighter II champion, and get off his smartphone!) ...But... knowing Nintendo, it'll probably be crappy Virtual Console games that everyone already has many times over. At least, until the end of the Nintendo Switch's lifespan, when you'll really get the good stuff. It also reminds me of the EA Vault with EA Access, and I didn't like it when Electronic Arts did it. We already have this for free with the My Nintendo rewards program. Nintendo calls it “Just For You” offers and they're total garbage. Do you think the deals would get better with a subscription fee to add to the pot? Probably not. Of course, it's free that Nintendo will allow you to buy games from them! Why, if it were possible, Nintendo would allow you to buy digital games with no console to play them on. I think it's a safe assumption that your Nintendo eShop balance will be shared with the Wii U/3DS one, if your Nintendo Account will be the same. That means any Nintendo eShop cards you win from the free-to-enter KoopaTV Loyalty Rewards Program may go to future Nintendo Switch purchases. Awesome! For all information on the KoopaTV Loyalty Rewards Program, click on this hyperlink. You don't need to pay money to have friends! Great! By manage, that means you can delete your friend if you want. It's unclear what other functionality there will be with the friends list. The Joy-Con have an equivalent of a print screen button, and you can share screenshots to social media with them. I would like to take this opportunity to talk about the lack of Miiverse on the Nintendo Switch, since screenshots have become a primary area of focus for why Miiverse exists ever since its disastrous redesign a year and a half ago. Yes, Miiverse will not make the transition to the new system. In its place are third-party social mediums, such as Facebook and Twitter. If you're fine with everyone on your timeline seeing your screenshots from your games (or you could make a new account on a social media platform JUST to dump screenshots, which I could find myself doing), then that's not a big deal for you. However, Miiverse is more than just sharing screenshots. You also could meet a lot of like-minded people in an officially-ran forum there. And by like-minded, I mean similar interests, which you might not find at other gaming discussion locations. It's a clean place. For the most part. The way it's set up, you can Follow people and Friend them (if you have a Wii U). 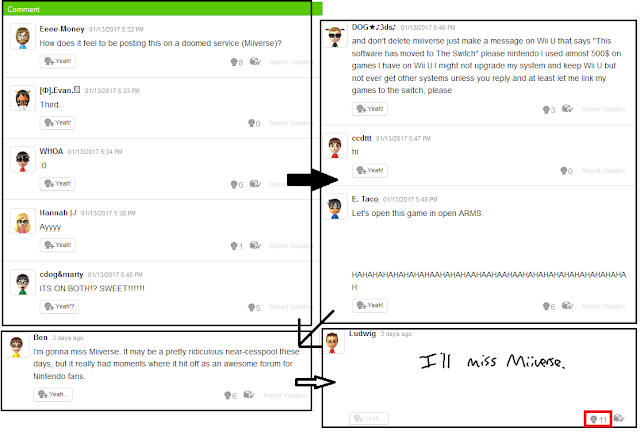 My “I'll miss Miiverse.” comment is the most Yeahed out of the hundreds of comments in Nintendo Skye's post-presentation post. While it is true that Miiverse won't vanish overnight on March 3, 2017, it clearly won't be around for much longer than that. Nintendo Wi-Fi Connection was around for a little while after the Wii U's launch, but this time, it's clear Nintendo wants to just be done with Miiverse. It has quite a number of weird, unintended sub-cultures. Some find them beautiful. Nintendo might find it disturbing. It doesn't help that a few people are outright hacking Miiverse. I wrote a whole article on just the Nintendo Switch Parental Controls yesterday. Read it. In conclusion, it's important to note that better online service means you ought to pay for it. Online infrastructure requires investment, after all. However, Nintendo hasn't actually gone out and promised competitive online infrastructure. They could just pocket the money. We don't know the rates, or how often you'll have to pay. 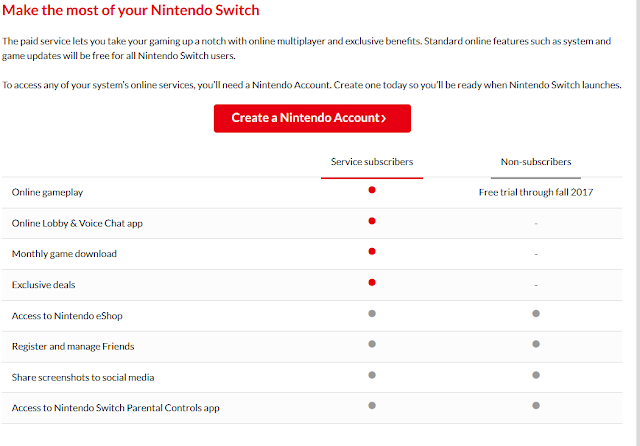 We also don't know how many games might let you play online WITHOUT paying the subscription, since the site states, “After the free-trial period, most games will require a paid online service subscription from Nintendo in order to play online.” Most games? So what about Splatoon 2? This online subscription fee is essentially a World of Warcraft-style subscription fee for a game like Splatoon 2, which exists for online playing. But you'd also be paying the one-time fee of acquiring the game to begin with. As it stands, these subscription-only features are all things that we already have in some form, or will be useless. What isn't known is if there will be other features, or unspecified quality upgrades. Depending on how that goes, I might be wishing for Wii U-era quality for free. As far as I'm concerned, Nintendo is asking me to pay them to remove Miiverse and outsource functionality to smartphones, which is a bad deal. Ludwig has never participated in a gaming subscription model before. The closest thing for him would be subscribing to Nintendo Power magazine. You should Follow Ludwig on Miiverse at NNID PrinceOfKoopas, and inflate his Miiverse performance metrics as high as you can before it closes. That way, he can feel good about himself. As long as you don't use the mobile app, then the Switch should be safe from snoopers. There are updated details come early June. SUCH AS... pricing! By May 2018, the Nintendo Switch Online still isn't released to the public, but they are definitely solidifying it. Nintendo Switch Online has been released as of September 18, 2018. It's definitely keeping true to having less features. So, in other words, everything I actually give a crap about is still free, and everything I don't give a crap about I don't get forced on me by default. Is there supposed to be a downside to this? Basically the only game on Wii U that I've been at all interested in online play in is Smash 4, and even when the connection is good there's still too much input lag for me. Nintendo has never at any point given me a single reason to care whatsoever about its online capabilities. If I want to play online I go to a FTP MMO or something. Online play isn't what Nintendo is FOR. I've never heard a single opinion from anyone that Nintendo's online play is anything but shite. They'd almost be better served doing away with online play entirely, I mean clearly they've never made more than a token effort to provide it. And if the Switch changes that, I will be genuinely astounded. Pleased to no end, but ASTOUNDED. I wouldn't dismiss Nintendo's online play as total garbage, 'cause hey, I've had lots of fun with it, and I play Smash 4 online frequently. I'm sure there's a lot of room for improvement, though. As for the "online play isn't what Nintendo is FOR" statement, Splatoon is pretty much unplayable without online play... so there's that. Splatoon is a great game! Yeah, I...don't understand the appeal of games like Splatoon. So, you want to throw me in a team with a bunch of people I don't know, competing against a bunch of OTHER people I don't know, where there's not really much possibility of any real teamwork? Where I won't be able to have any real impact on whether my "team" wins or loses, but if we DO lose I'm going to get blamed for it? DON'T sign me up! First of all, there are modes where you can play with your friends, and play with them in a structured, ranked environment where you can plan things out ahead of time. Second, for the modes where it is random people vs. random people, that's still fine with me. Over a sustained period of time (and you could see this more quickly and more obviously during a Splatfest), you're able to identify individual achieving players. Because the map rotation is small, if you play with the same people long enough (and their names aren't in Japanese so you can actually tell them apart), you can identify behavioural patterns and plan your own actions accordingly. If they're also paying attention, they'll pick up on what you do, too. Basically, the more awareness you have, the better the social experience, even if it's non-verbal communication. Alsooo your impact on the team is actually pretty measurable. You might learn something, I dunno. Yes, this exactly, the online had the fun component in the form of effectively "reading" what the other people on your team are trying to do, and forming a complementary strategy on the fly. Right, it's a unique form of fun that you can't really find in other games/systems. I'm sure it doesn't appeal to everyone, but I often get a kick out of it! ...I still hate driving as a whole, though, which is why I'm a Team Planes kinda guy. Hmm, another small point is there may be a Miiverse replacement coming for the Switch. We don't know yet. Though, given the integration of the share button on the controller, Nintendo could also just be relying on the third-party social media connectivity from there for their systems. So Miiverse could reincarnate. It's not that likely, but still, ya never know, right? I know, there's a minimal chance of such a thing happening. But it could be hiding away, maybe in a lesser form as part of their smartphone app or something. I just feel like there are at least parts of Miiverse that they might want to preserve in a Nintendo-centered environment, as opposed to the crowded external social media services. To be a successor to Miiverse (which I view as the successor to the Nintendo NSider Forums), it needs to allow you to meet new people (aka people who are not your "friends" already) and freely communicate with them (not pre-set phrases) in a non-game setting. You say the chance is minimal, and I believe the chance is...zero. But I hope you're right.